State state of Daniel Filho’s mental health has been dragging on for some time. Last we checked in was just under a year ago, wherein a motion requesting the appointment of a Receivership was denied. At issue was Filho not being convicted of a crime, which is technically true. Despite being indicted in 2015, Filho’s ongoing mental health issues have prevented him from standing trial. physicians have diagnosed the defendant incompetent to stand trial and non-restorable in the foreseeable future. Based on these findings, the charges against the defendant will likely be dismissed without prejudice, which means that if he subsequently becomes competent, the government can charge him again. The DOJ wasn’t happy with this and insisted that Filho (right) continues to ‘pose a financial danger to the public‘. There’s now a question before the court regarding potential civil proceedings, which the DOJ have been asked to brief the court by August 8th. The SEC’s civil case against Filho was stayed pending conclusion of criminal proceedings in October, 2015. Filho will have until August 15th to respond to the DOJ’s brief, after which presumably a hearing will be held to decide the matter. If the SEC’s civil case resumes, one would assume a Receivership will be appointed – an important step toward DFRF Enterprises victims recouping losses. In the meantime Filho remains in the custody of the U.S. Marshal. As I understand it, regardless of the outcome of the SEC’s proceedings, Filho will remain in custody and continue to receive treatment. 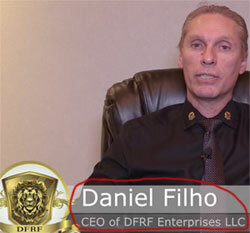 Update November 15th 2018 – On November 13th Daniel Filho’s DFRF Enterprises indictment was dismissed. bloody genius mate. insanity plea like a Boss. smh. Andrew, the guy has basically been declared insane by the US authorities which means he won’t be going anywhere out of custody anytime soon. So how does that make him a Boss? Not so great. Instead actual prison Filho will be in a medicated one, for an indefinite period of time. Probs better than being taken out by the cartel… but still. I was in jail with this man hes a genius. Or he got money…. Not enough of an update to warrant a separate article, but a seizure receipt has popped up on the case docket. Seems related to an FBI case and details the seizure of $164,442, taken from a Regions Bank Account tied to the case. The notice was only filed on October 4th but the seizure is dated August 19th.